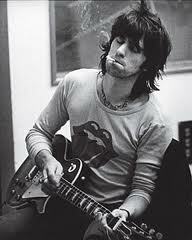 Reading this review of Keith Richards‘ autobiography – Life– enthused me to browse through it again with renewed interest. It reminded me what a good read the book is, but also how well cross-fertilisation can happen between a work and the comments around it. Now, where was I ... No really, where was I? Perhaps it’s me being overly interested in the opinions of others, but Dan Chiasson‘s article was one of those that makes you see more in the book than you saw yourself first time. This is what thought-provoking journalism – and even more so, the critiques we do in creative development research – should be trying to do every time. Reading the book itself has been a chastening experience. Firstly, I realise how uncool I am. I realised anyway, but to read about the ‘scene’ Richards was around in 60s London is to be transported into another world. Not one I hugely admire, with my wage-earning, child-rearing hat on – and not good for the soul. But definitely cooler, if cool matters, than my watching of Grey’s Anatomy box-sets with the missus. Secondly, I realise I have allowed my view of Richards’ life to be coloured by the way he is now. I’d wrapped him up in a bundled labelled alternately “60s victim” and “ageing rocker”. But life is as much about the getting there as the place you end up, is it not? Richards’ story reveals several different Keefs, sometimes operating at the same time, and hindsight doesn’t really help us understand any of them. But they all seem unrecognisable from the man now. Even Richards himself doesn’t shed much light on the conundrum: what he rates about himself (his skull rings for example; his “gallantry”, evoked even when moving in on Anita Pallenberg under the nose of Brian Jones) aren’t necessarily the things we’d pick out. But Chiasson is right: Richards has a sharper eye and better memory than we might have assumed, at least until you get to the heroin years. His is a riveting story of a talented man who surfed through much of his life, only dimly aware of the size and force of the wave he was on. You want to step back and laugh at the outlandish excesses – and you can do. And he is not now the icon of cool that he once was. But I was left thinking, what I make of this man depends upon some answers to some much deeper questions. Do I admire the bravery of artists who just get out and do it? Or slightly pity the failings in critical faculties that so often come with that lack of inhibition? Do I admire people who try to be true to themselves, as society increasingly demands – even when I can see the damage they have done to other people to achieve this? These contradictions nestle uncomfortably in my head. This entry was posted in 21st Century Britain, All Over The World, Media, Society and tagged art, books, brand communications, Dan Chiasson, Keith Richards, media, music, New York Review of Books, qualitative research, reviews, Rolling Stones, society. Bookmark the permalink. Reached your site through Google. You know I am subscribing to your rss feed. I would really like to say thank you such a lot of for the job you have made in writing this post. I am hoping the same most reliable work from you in the future too.